Everyone longs for a brilliant white smile. Nothing beats the feeling of minty fresh breath and that feeling of just-being-to-the-dentist cleanliness. We all use toothpaste, but what type should we use? what special considerations should be taken? Flavor? Brand loyalty? Would a dentist or a dental hygienist recommend it? Toothpastes for adults are just that- for adults. They usually have a slightly higher dosage of fluoride and have more of a gritty texture to remove plaque and tartar from the teeth more effectively than a child’s gel toothpaste does. Most commercial brands of toothpaste contain fluoride. For those that are not comfortable with this, there are natural toothpastes made from herbs and clays that do not contain fluoride. These toothpastes are made to whiten teeth over a length of time. With regular daily use, they whiten the teeth by a few shades. How much whiter they become can depend on the amount of staining to the teeth. This is specifically for people that have sensitive teeth. For people with sensitive teeth, conventional toothpastes can cause pain to the teeth and gums, making it difficult for them to regularly brush their teeth. Tooth brushing is essential to good oral hygiene. By regularly brushing teeth after meals, or at least twice a day, harmful tooth decay, gum disease and painful dental work are easily prevented. Dentists and oral hygienists usually have a favorite brand, or brands, that they recommend and have found to be very effective at removal of plaque and food debris. Colgate Total Whitening Toothpaste is a whitening toothpaste that whitens teeth and helps prevent gum disease. In 24 hours it begins to fortify the enamel of the teeth and protect from degradation. Also, with regular use, this toothpaste improves overall gum health within four weeks, reducing and preventing future gingivitis. Sensodyne Pronamel Gentle Whitening Toothpaste is a whitening toothpaste that is geared toward people that suffer from tooth sensitivity, offering the whitening benefits of most toothpastes without the pain that comes from brushing. It also helps to harden the tooth enamel and prevent acid erosion on the teeth that can occur from dietary issues. It protects against cavities and gingivitis without the abrasiveness some find to be too painful. Tom’s of Maine Antiplaque and Whitening Fluoride-Free Toothpaste is a natural toothpaste that, as the name states, contains no fluoride. It contains naturally sourced silicas to provide a natural grit to clean the teeth. Tom’s of Maine uses zinc citrate that is a naturally sourced mineral and uses a sweetener called xylitol that occurs naturally from sources such as birch trees and corn. 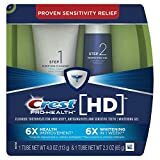 Crest Pro-Health Advanced fights bad breath, tartar and plaque buildup, and helps prevent gingivitis with regular use. Crest Pro-Health also helps to fight and prevent enamel softening from acid erosion. This toothpaste has been shown to prevent plaque buildup and acid erosion more effectively than the ordinary fluoridated toothpaste. Two Step Toothpaste System is touted to be the Crest company’s biggest breakthrough since fluoride. With regular use this two step system both whitens and helps reverse gingivitis. The first step in this two step system removes plaque and cleans the teeth. The second step is a perfecting gel that whitens and polishes for an effective overall brushing experience. Jack N’ Jill Natural Toothpaste is another natural toothpaste containing no fluoride and made from naturally sourced ingredients, such as calendula flowers. This brand is a gel, as opposed to a paste and is sweetened with xylitol. This flavoring of this particular gel comes directly from bananas, but they do also offer a wide variety of flavors. Tom’s of Maine Antiplaque & Whitening Fluoride Free is a naturally sourced toothpaste that fights plaque and whitens teeth without fluoride. Using hydrated silicas and calcium carbonate this paste whitens teeth and removes stains without ingredients that some find questionable. 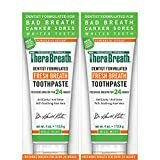 This is a anticavity and anti tartar toothpaste recommended by dentists to help combat bad breath, dry mouth, and canker sores. It is a natural based toothpaste, containing no artificial colors, flavors, or detergents, but still contains fluoride. As the name suggests, it has been recommended by dentists for its superior cleaning and bad breath fighting capabilities. This toothpaste whitens and removes stains while fighting bad breath for hours after you’ve brushed. It is fluoridated for anticavity protection, but it contains no foaming agents like sodium lauryl sulfate. CloSYS attacks bacteria that cause bad breath while leaving the healthy bacteria the mouth requires intact. It contains foaming action, designed to reach difficult to reach places, like in between the teeth. This foaming action targets germs and bad breath causing bacteria helping achieve an overall cleanliness. It also whitens the teeth with regular use. How important is it to you that a tooth paste be fluoride free and natural, or just a simple conventional brand? Knowing the ingredients is also crucial to avoid pain if you have sensitive teeth. Toothpastes tend to run more expensive than their counterparts, and whitening pastes can run more than both. When selecting toothpaste it’s important to figure out what makes it stand out to you in particular and compare prices of other brands. Expensive doesn’t always necessarily mean better in this case. Has the toothpaste you are considering been approved by a dentist or a dental hygienist? If not, how important is it to you that is has been? Individual dentists will usually tell their patients a brand that they feel works the best or may recommend a specialty toothpaste if necessary. As previously mentioned, toothpaste is a hygienic necessity. Selecting cost effective and high quality toothpaste can seem like a daunting process. Dentist recommendations and sufficient information on different varieties of toothpaste can make the selection process less frustrating and help you find the toothpaste that is best for you to give you that dazzling white smile and healthy teeth.